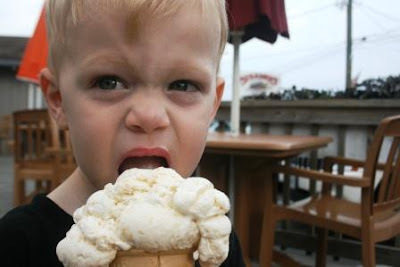 So before we even came to Chincoteague, I kept reading about how ice cream was a really big deal there. Ice cream isn't usually my first dessert choice, but Paul and the boys sure love it, so I was looking forward to testing out the different options. 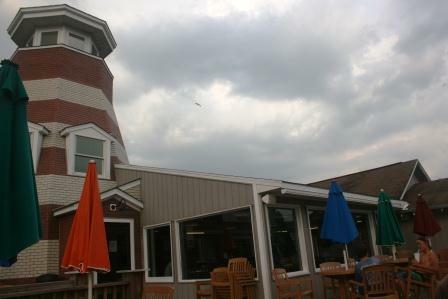 The first place we visited was the Island Creamery. We'd already tried their blueberry ice cream at the Blueberry Festival. Their cones are HUGE. Cort had cotton candy, Reid had peach, and Pierce had cotton candy. To be truthful, these cones were just a bit too large for little guys. They made quite a mess! Good thing we were outside. 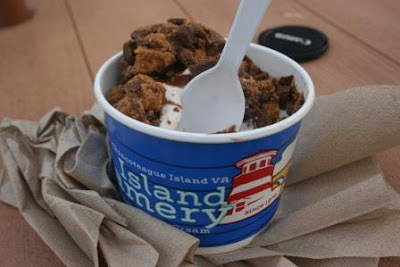 As for me, I had a Reeses Cup sundae. If you've been following Two Bears Farm for a while, you probably already know I have a thing for Reeses cups. Particularly the minis. Mmmmm. It's a pretty inviting little place - cute umbrella tables outside and a fairly large deck. Several times when we drove by, the line was way out the door. 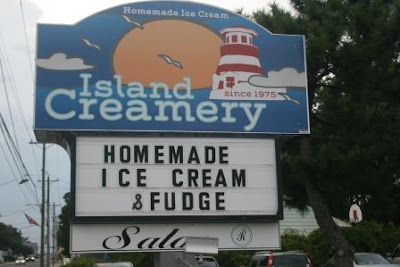 I will say that as much as we enjoyed the ice cream from here (and it was very very good), it still can't touch the ice cream from our local Homestead Creamery. 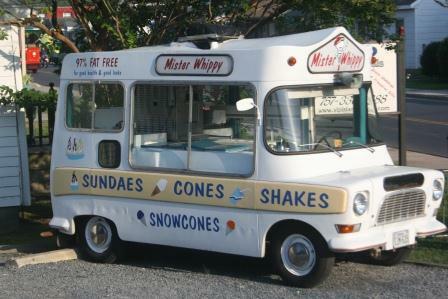 Our next ice cream sampling took place at Mister Whippy, which has a bit of a nostalgic feel to it. I got a cone this time, but we got smart with the twins and got their ice cream in cups instead of cones this time around. This soft serve seemed very similar to what you might get at Dairy Queen. I heard this statistic on the radio one morning when I was running that something like 80% of people prefer hard ice cream. Me? I prefer soft serve. 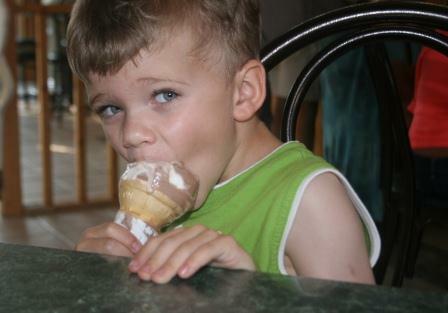 I think Pierce just prefers any type of ice cream he can get his hands on! 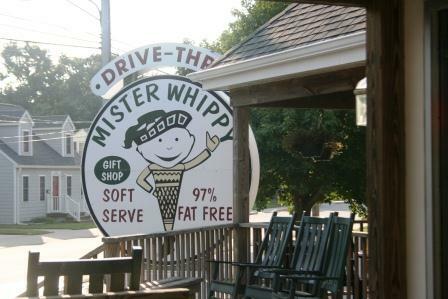 My favorite part of Mister Whippy's? Seeing this cute tiny little old ice cream truck! How adorable is this? So there is a third ice cream place on Chincoteague that is an old fashioned ice cream parlor (I think it was called Muellers), but we went there our last night (on a Friday, at around 5:45 pm) and it was closed! We were disappointed. Not sure if it was just closed during this time or if it has shut down. Instead, we went to Orange Julius. I thought they'd all disappeared, but it turns out that there is still one on Chincoteague (and maybe in other places too?). Total yum - I hadn't had one since I was a teenager! 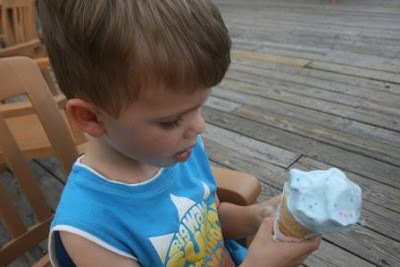 We had a fun quest to try out all the ice cream on Chincoteague! The boys were definitely loving it. 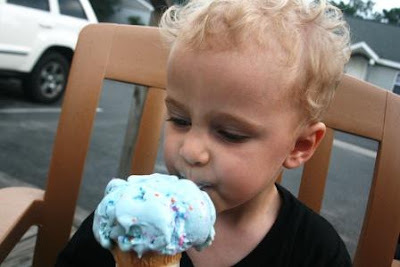 Readers, what is your favorite ice cream? The ice cream looks so tasty! Cute photos of the boys! I like soft serve ice cream best and you and I have Reese's peanut butter cups in common. My husband accuses me of painting the bedroom in chocolate and peanut butter colors!!! That ice cream truck is adorable! I have not seen an Orange Julius in about 20 years! We love to go to a local soft serve ice cream place near us. Ice cream shop exploring looks like a lot of fun. Love the pics of the boys with the cones. Priceless. A girl after my own heart -- an ice cream marathon... my dream come true. I'm with Pierce! Love ice cream! All of them sound very yummy to me. I love ice cream! I prefer soft serve, but I think Pierce has the right idea - any ice cream that you can get your hands on, is good ice cream. Orange Julius! There are a couple of those near my parents' place! There's one near the food court in the mall we usually go to, and I *think* there is one in the other mall nearby. On one of our last trips to see Livie's grandparents, I bought a small one and she and I shared. She told me, "I like it!" My blood sugar spiked just reading this. You ROCK mom! 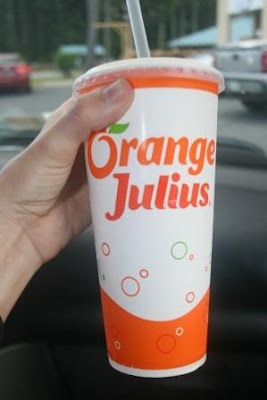 Our local Dairy Queen now has Orange Julius! So it must be a division of DQ. Sorry not a big ice cream fan either. I used to just eat the leftovers from the kids, but they have all grown up and I'd have to order my own. Love that little ice cream truck. Well, of course Reeses mini's are better! Everything Mini is better! This was a particularly yummy post. I approve. Jessica recently posted How To Create Multiple Links on One Image. 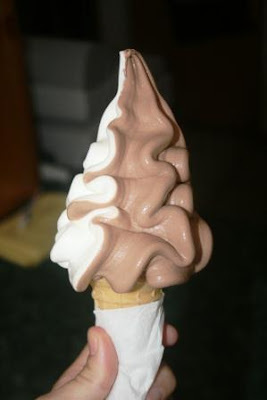 Just yesterday I was craving soft serve-I like the chocolate and vanilla swirled together. But I also love hard ice cream, and I certainly wouldn't say no to anything made with Reese's peanut butter cups either. they all look yummy, wouldn't know which to choose.. So much ice cream to cope with on one post! We have ice cream vans in the area you showed, the ones here belonging to Kelly's of Bodmin now we English are known for being quaint! My favourite flavour is ginger from Callestick Farm. Great you had such a good time. My boys would love that! We are huge ice cream fans here. I had no idea they were known for ice cream. I bet the boys loved all the ice cream! The boys look so cute eating their ice cream! Yum! I prefer soft serve myself, unless we're talking turtle...now that's some seriously good ice cream! Soft serve is okay, but I really like a scoop of mint chocolate chip. I had Orange Julius a couple of years ago at Concord Mills in NC...yummy! Now, I must go eat some ice cream...we are Turkey Hill fans here, peanut butter chocolate! Seeing the boys eating that ice cream makes me so hungry for it. That is one thing I really miss having once in awhile. I think it depends on my mood whether I like soft or hard ice cream. Just looking at those ice cream cones from the first place and I know they were a mess. There was so much hanging off to the sides! I scanned through the pictures first and thought wow those cones are big for the kids. Such wonderful treats you had. I love custard cones. I don't think I have ever had an Orange Julius. Glad you got to enjoy one again! I love most any ice cream! Those pics made me hungry for some - gotta run!!! i like ice cream. it doesn't like me. also. dude. orange julius! man. i haven't heard that in ages! Those cones are almost as big as your boys! I'm with you, not big on ice cream, but the cotton candy flavor sounds yummy. I could live off of ice cream. Seriously. And yeah, we have Orange Julius locations here with our DQs! 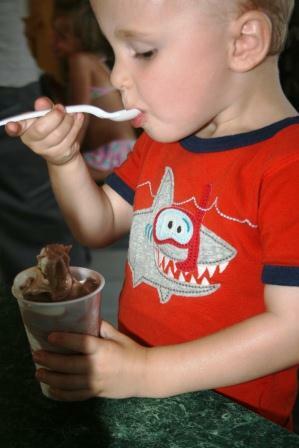 You guys didn't try ALL the Ice Cream on Chincoteague as you stated... you forgot Muller's ice Cream Parlor on Main Street? They serve Belgian Waffle with fresh cut local peaches on them? You might want to check that out. It's the oldest ice cream parlor on the island. Those first set of cones are as big as the boys' heads! I love reese too! !